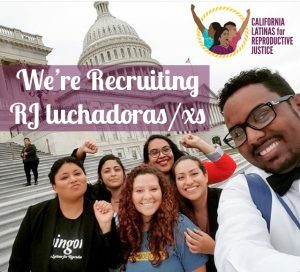 Our Latinas4RJ chapters work to develop Latina/x leaders that are empowered in Reproductive Justice “RJ” Herstory, using its framework, and practice to support reproductive justice issues for themselves, their families, friends, and communities. Latinas4RJ Chapter Leaders meet monthly, learn the ins-and-outs of policy in California and beyond, and are empowered to be advocates who amplify the voices of their Latina/x communities. Interested in finding out how you too can advocate for your community by becoming a Latina4RJ Chapter leader? Email Christina Lares at christina@clrj.org.